'The School Council is playing a key role. It is instrumental in communicating pupils' views to leaders and setting a good example.' Ofsted. 2016. At Barnburgh Primary School our School Council is made up of two representatives from each class (not including Early Years). Each member of the School Council is elected onto the Council through a process promoting democracy. The School Council represents the views of all pupils and gets things done! Our School Council meets weekly with Miss Johnson and discusses current issues that matter to the children. In addition, the School Council members are ambassadors for the school and attend special events in the local community. Take a look at some of our application forms below. PLEASE SEE BELOW TO VIEW THE IMPACT OF OUR SCHOOL COUNCIL. The School Council helped to raise over £150 through the 'Bring and Buy' book sale to help purchase new books for the school reading corner. All books which were left over were kindly donated to the British Heart Foundation. Our School Council were invited to launch the new defibrillator. The community of Barnburgh worked together to get a defibrillator to save people’s lives. On Sunday 13th November 2016, representatives from the School Council attended a service of remembrance at St Peter's Church, Barnburgh. 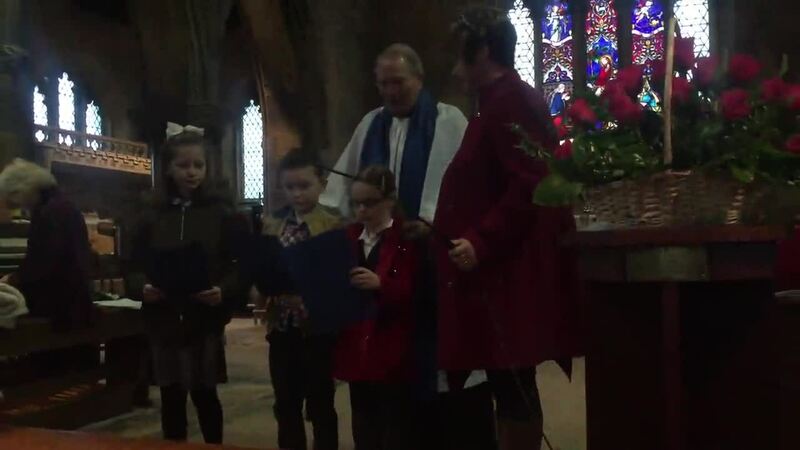 They made us very proud by reading some poems to the congregation that our Year 6 pupils had written. Please see the photo below. On Sunday 8th January 2017, three members of the School Council attended a service at St Peter's Church, Barnburgh with our Chair of Governors, Janine Reid, to celebrate the plough. They made us all very proud by reading a poem together during the service. Please see a photo and video of the reading below.